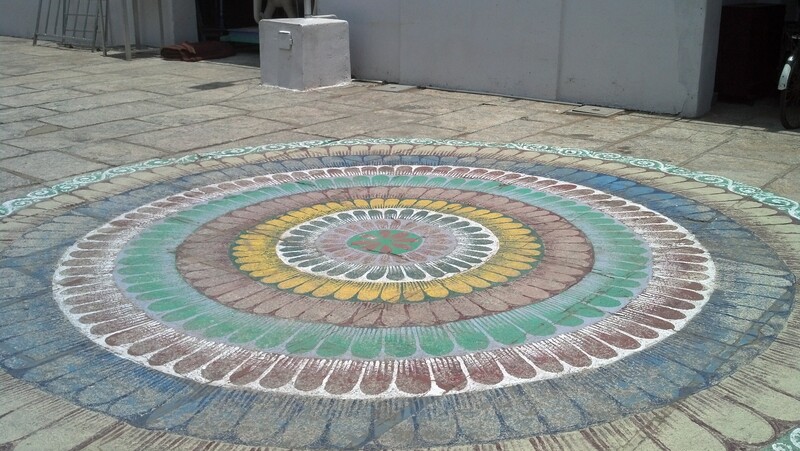 A number of chalk drawings adorn the temple pavement. Less elaborate ones can be seen in front of houses. Afterward we ate lunch at another Saravana Bhavan (see the earlier post: Food, Glorious Food). 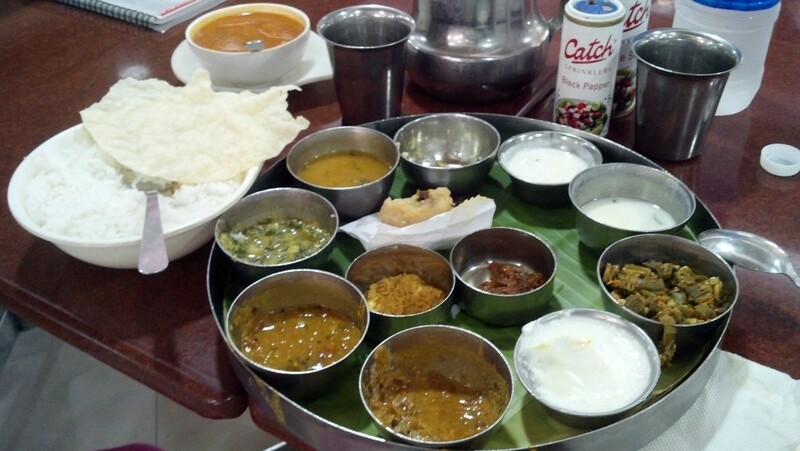 This thali meal is, I understand, typical of South India. It’s a sampler of little soups and stews and yogurt concoctions. Surely people don’t eat this with their hands, I thought. (It was all either too spicy or too yogurty for Brianna.) I had pretty much eaten my fill of the contents of those little metal bowls with the aid of a spoon, when I thought to look around at what the locals were doing. Other diners were emptying the bowl of white rice onto the middle of the (banana?) leaf-lined tray. Then they poured one or more of the stews over it and ate that with their hands. I gave it a try. Not bad, but I was too full to eat much more. 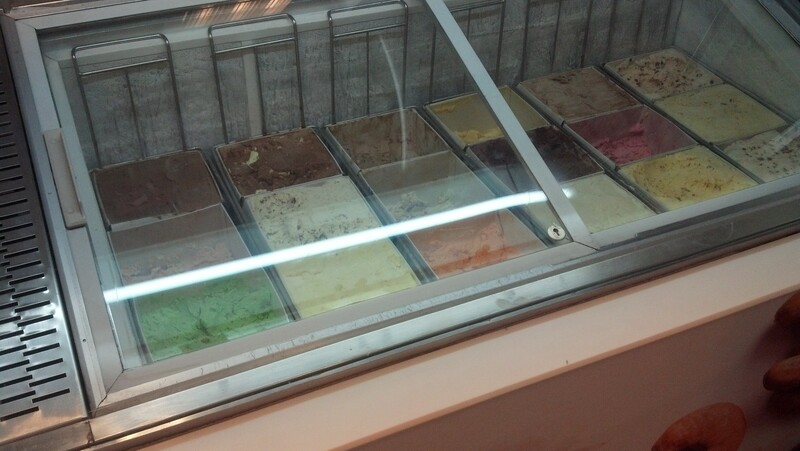 We of course had to sample the at least two dozen flavors of ice cream, most of them fruity. (Well, we didn’t sample them all, though we would have liked to.) 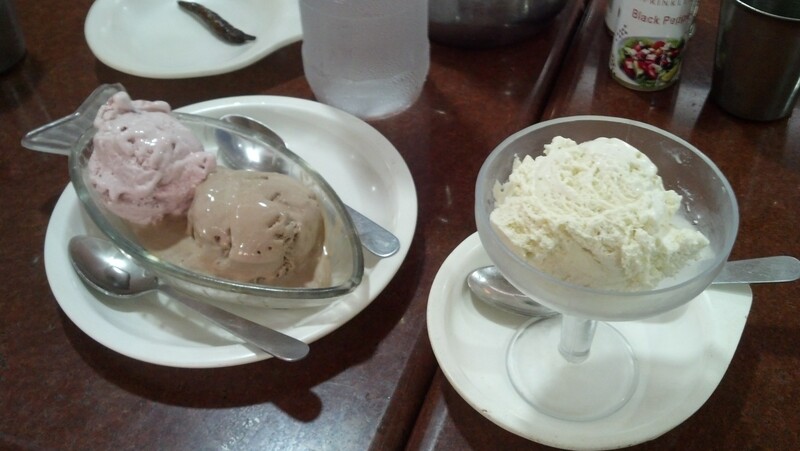 We were told it was kulfi, though I’m not sure what differentiates that from ice cream. It seems to depend on who you ask or whose Web page you read. Whatever it was, it was very tasty, and only 45 rupees a scoop (about 60 cents). Neapolitan–I asked for mango but got vanilla. It must have been my accent. Finding it was something of a feat, as the stall is located in the obscure basement of a row of shops. The owner directed us to his second location in the basement of a similar row of shops near the train station. Both were a little difficult to browse, since most of the books were stacked horizontally, about four or five feet high and many volumes deep. The second location must have been more along the lines of a warehouse, as the entire inventory was bundled up with rope into packages of six to ten books. 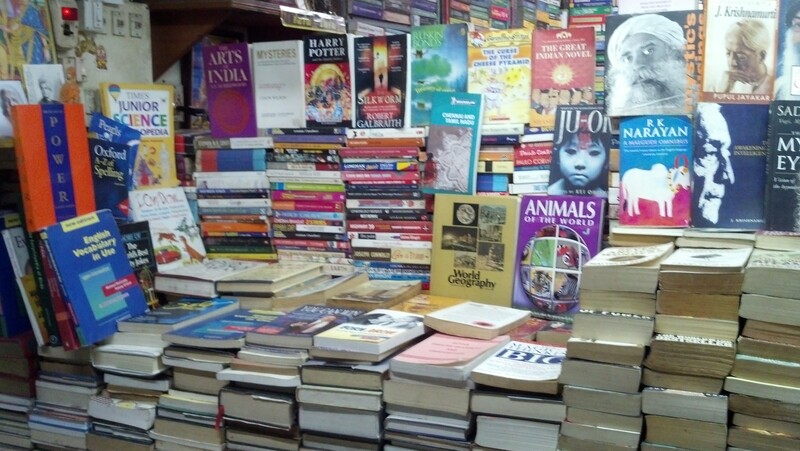 Most were paperbacks–contemporary fiction, spirituality, and textbooks. I did find a nicely illustrated 1984 hardcover edition of The Wind in the Willows. Noon on the following day found Brianna and me melting into two little puddles on the road by Elliott Beach. We found a “Pupil” restaurant, where I got a tasty curried vegetable dish and Brianna got a chicken burger. (Unfortunately, we didn’t foresee that it would be spicy). We were the only diners, so we had all the AC and Bollywood music videos to ourselves. Very educational. 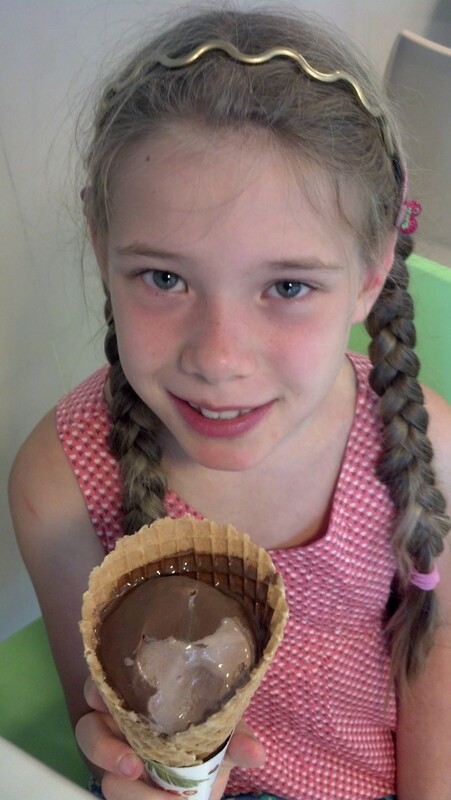 Then we went next door to the Ibaco–more great ice cream! 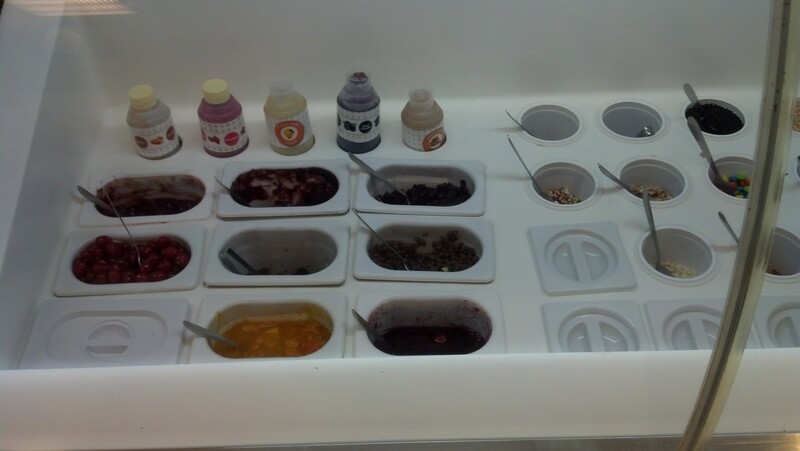 The shop was very clean and attractive, with innovative flavors, reasonable prices, and great quality. The approximately two dozen flavors included Electric Blackcurrant, complete with dried currants (my choice–great with Dark Chocolate Secret); Cream ‘n Cookies (vanilla with toffee and malt powder); Figs ‘n Honey; Lychee Valley; Queen’s Toffee (English toffee flavor with cookie bits); and Fruit Bonanza, with figs, blackcurrants, pineapple, raisins, cashews, karonda (commonly used as a spice or pickle, according to Google), and tutti frutty (preserved papaya). 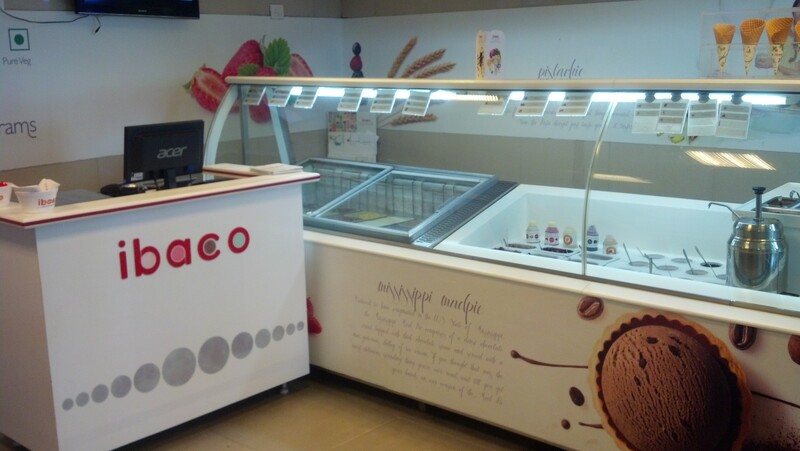 Like many recent yogurt shops in the U.S., Ibaco sells by weight (7o rupees, or just over a dollar, for 100g) and allows customers to design their own creations with a variety of toppings. 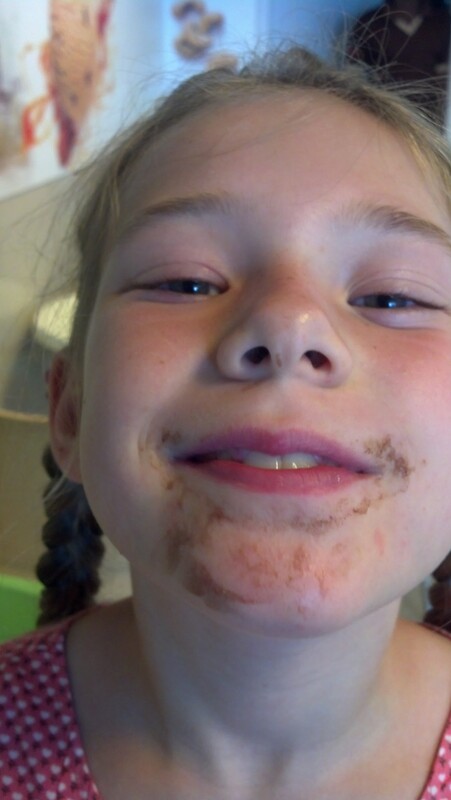 Brianna settled for chocolate syrup, which, fortunately, hardened on her ice cream instead of dripping onto her clothes. 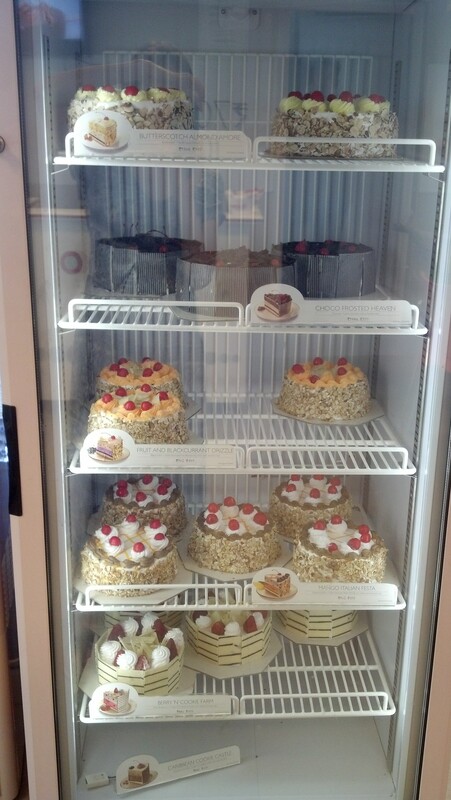 Ice cream cakes were 499 to 999 rupees (around $8 to $16). Ibaco is associated with Hatsun, “the largest private sector dairy in India. Hatsun’s philosophy is quite simple: Show a genuine care for the consumers” (Hatsun Web site). It seems to be working. The next day we arrived an hour early for the Bollywood dance class Brianna was visiting at an after school center. 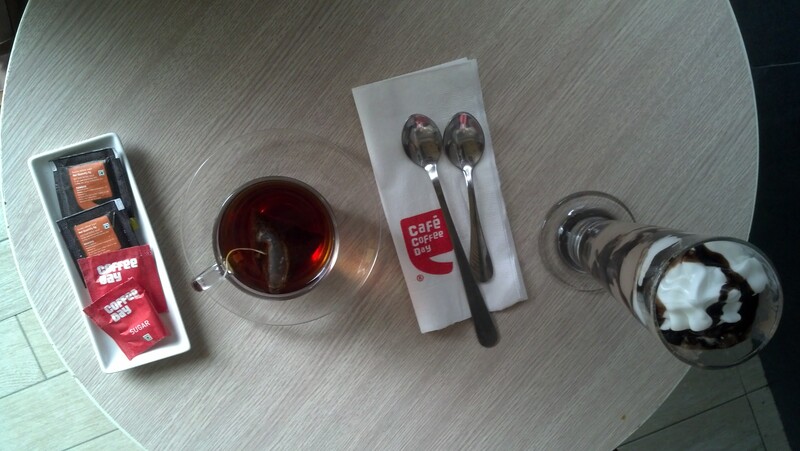 We decided to wait at the Cafe Coffee Day across the street, since numerous informants had recommended the chain. 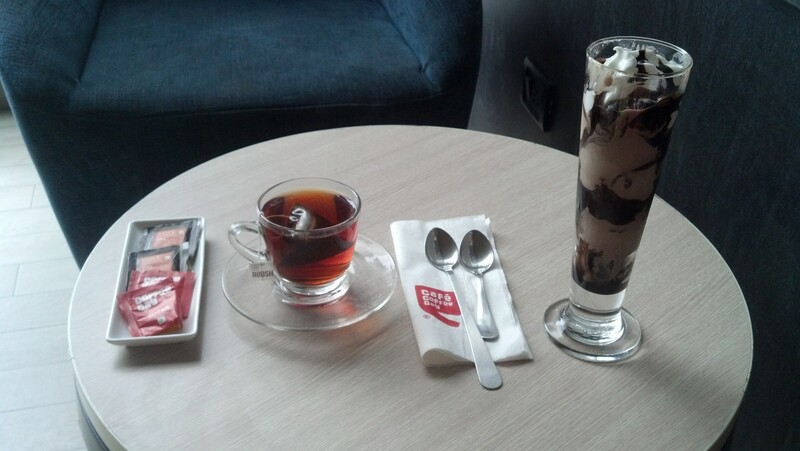 Honesty requires me to say that the brownie fudge sundae was only so-so, but the Assam tea was quite good. The company’s renown might be built on their coffee rather than their desserts. On the other hand, their most popular desserts were sold out, so I’ll have to go back before rendering a final opinion on that. Brianna, who got the largest part of the sundae, had no complaints. She danced it off afterward. 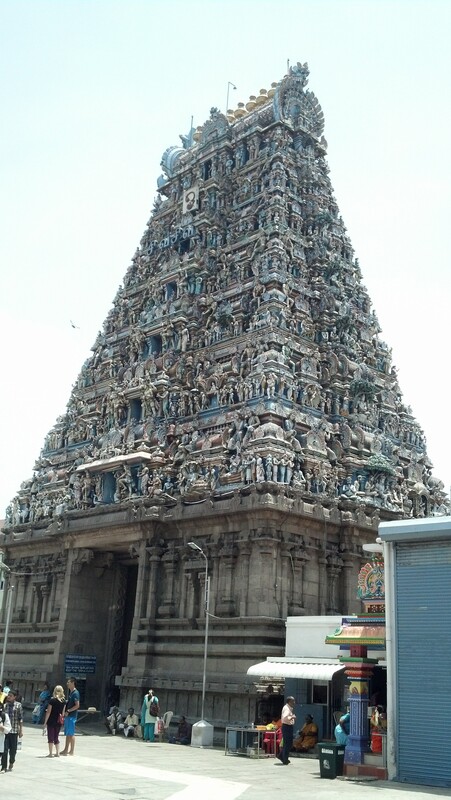 This entry was posted in books, Chennai, food, India, Tamil Nadu, Travel and tagged books, Cafe Coffee Day, Chennai, coffee shops, food, Ibaco, ice cream, India, Kapaleeswarar temple, Murugan Books, restaurants, Saravana Bhavan, South Asia, Tamil Nadu, thali, Travel. Bookmark the permalink. What great experiences. thank you for sharing with us her at home. My mouth waters with each picture. Keep the updates coming.